Mother of Pearl is used to make crosses, earrings, brooches, and to inlay furniture and boxes. Skilled artisans use beautiful multi-hued shells to create delicate filigrees. 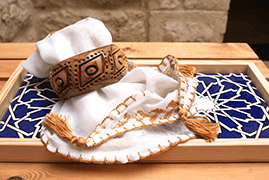 It is believed that Monks from the Church of the Nativity in Bethlehem introduced wood and Pearl carving techniques to the locals during the fourth century. Because of the availability of material, woodcarving became very popular and later spread to surrounding towns around Bethlehem. The earliest products were rosary beads carved from olive pits and reproductions of the Church of the Holy Sepulcher and the Church of the Nativity.